Find anything within all 300+ websites that make up "Genealogy in St. Louis"
Subscribe to "Genealogy in St. Louis" e-Mail Group - a place to post comments and queries to fellow St. Louis researchers. Presently 1025 people. Contains both personal Web site links and E-Mail addresses of people with a St. Louis connection. By the way, newest entries are added at the bottom. As most of you know, on April 4, 2001, I posted a few memories I had of growing up in St. Louis. I received so many great replies that I thought I'd post some of them here. (Newest ones are posted at the bottom). This is by far the most viewed website of all the 300+ websites that make up "Genealogy in St. Louis". This is the new URL that the Jefferson County Missouri Heritage & Historical Society recently unveiled. (F) "Tales from Bellefontaine Cemetery" by Carol Ferring Shepley in 2008 (372 pages). In the above website I've listed all birth, marriage, and deaths of those known to have occurred mostly in the St. Louis Metro area (Missouri and Illinois). This is the new URL that the Archdiocese changed on 8/1/2018. A list of over 1500 early St. Louis photography studios (with their varying addresses and dates of operation) that might help date some of your family portraits. A major portion of this information comes from Tracy Lewis in Anchorage, Alaska. Thanks Tracy. Almost all the information in this list comes from City Directories or actual dated photographs. Latest addition is an excerpt from the 1899 Encyclopedia of St. Louis by Hyde concerning the photography industry in St. Louis at that time. The 1967 death certificates are online (they join those from 1910 thru 1966)! Many of us remember Gaslight Square, if you were lucky enough to live in St. Louis in the narrow period of time that it flourished. To give a feel for how brief it was, I compared the addresses in 1963 (it's peak populaity) with what was there roughly ten years before, and even more dramatic, what was there ten years later. So far we have 332 Senior Classes listed with 45,413 names transcribed. Send your list in today. No, this is not a political statement. Regardless of your sentiment on the President, I think you will find these treatises both well written and fascinating. Wonder what the connection is? George Herbert Walker and Lucretia Wear (great grandparents of the current President) were both born in St. Louis in 1874, and married here in 1899. Lucretia Wear parents, James Hutchinson Wear and Nancy Eliza Holliday were married in St. Louis in 1866. They both died in St. Louis (1893 and 1942 respectively). David Davis Walker, father of George Herbert Walker, was born in Bloomington in 1840, and married his wife, Martha Adela Beaky, in St. Louis in 1862. They had six children born in St. Louis. In researching a St. Louisian's genealogical past I've found that invariably I link those people to places around the city. This site lists "famous" St. Louis places and show when they first showed up on the St. Louis scene (and, regrettably, when they ceased to exist (like the St. Louis Arena)). I've also added a number of linked photos. St. Louis Volunteer Look-ups (Updated 2/27/2014) Please submit single name at one time. Dave Lossos for 1954 St. Louis STREET ADDRESS Telephone Directory. (added 11/19/2007). As the title states, this "Bell Telephone Directory" is totally structured by street, then address. This was the last phone directory issued in 1954 before St. Louis switched from six to seven digit telephone numbers. So, to use it, ask for an address, and I tell you who lived there!. Dave Lossos for 1925 St. Louis City Directory No "reverse address" included. Dave Lossos for 1875 St. Louis City Directory I only have pages including "AAberg thru Breintenbueher" and "Knapmeier thru Zylewicz"
A useful website for finding zipcode locations (Thanks Linda for the tip). A useful website for finding area code locations (Thanks Linda for the tip). The Masonic Home of Missouri (formerly The Masonic Home for Children and the Elderly in St. Louis) will be celebrating their 125th Anniversary this year. We are working towards putting our ledgers in a searchable database for all to be able to access. We simply do not have the staff to do this project and are turning to volunteers to help us. Due to the age and brittleness of the ledgers, the data entry would have to be done in our offices in Columbia, Missouri. These ledgers, which detail information on who was admitted, from where and in some instances recount individual children's' information would be wonderful additions to any researchers notes. I was hoping that you would be able to post on your page about our need for volunteers to help with this project (this is the same project that Bethany Harrison has told you about on the page). At this time we are not able to do research nor supply information from the ledgers to researchers regarding the contents of the ledgers since they do not have table of contents and are quite detailed (and lengthy), so all requests for information cannot be fulfilled until we get the project moving along. The fact that the they are only allowing on-site transcriptions of the ledgers obviously precludes many of us from taking part in this project, but if you can help out it certainly seems worthwhile. Some suggestions for the latest genealogical websites and addresses available for researching your Irish ancestors. The long awaited online database of burials at St. Louis' largest Protestant cemetery is now operational (although a little tempermental). Be patient for it to load, it's well worth it. I know the effort involved in maintaining a single high school alumni class website, and the herculean effort to put this website of 58 senior classes together is truly remarkable. I received this link from Bobbie Verstraete, and on the website you will find details on all the classes from 1924-1982, including teachers and classmates. Great Job! 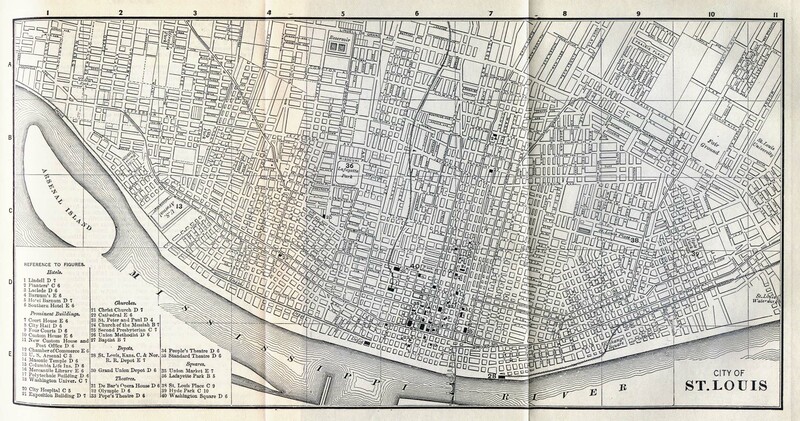 This is a map I created using the 1870 Ward map of the City of St. Louis. On it you will see the location of all the parishes within the St. Louis city that were formed up to that time with a predominant Irish congregation. I've also listed the date the parish open (and in some cases when they closed). Use your default graphics program to enlarge the image until you can clearly read the section of interest. This data and commentary is provided by Susan G. Rehkopf, Archivist,from the Archives of the Episcopal Diocese of Missour. This project is attempting to reconstruct data from the 1890 census. As of November 2007 we had over 200 families, with over a thousand individuals. Add your families today. Orphanages and homes are problematic for most genealogical researchers. That is certainly the case for St. Louis' Masonic Home. It is incredibly fortunate for researchers that the following information was preserved by Barb Matchett. Her Aunt and Uncle spent time there when they were kids. She recently came across a document that her Mom had locked away in her closet. It was a record of sorts, of children who had stayed at the home, and it has several pages of the children's names. These pages contained the children's names (including maiden names) and all have addresses of children next to their names. Thank you Barb. Nineteenth century facilities in St. Louis, with lots of pictures. Father William Barnaby Faherty, S. J. died today, at the age of 96. Fr. Faherty was a prolific writer, and published over forty books on very diverse topics. My personal opinion is that he was the most intelligent and humble person I have ever met and certainly one of the most accomplished St. Louis historians. Most St. Louis researchers know of the tremendous contributions made by Keith to our hobby of genealogy. Keith passed away last Saturday, July 30, 2011. He will certainly be missed. For those not aware, Keith was the guy who's been transcribing the St Louis Post-Dispatch Obituary Index for the past twenty years, a database that I use on a daily basis. His work will live on for many years to come. Index to "Pictorial St. Louis 1875"
It's been 11 years since I published the complete index to the book entitled Pictorial St. Louis - The Great Metropolis of the Mississippi Valley - A Topographical Survey drawn in perspective A. D. 1875 by Camille N. Dry. In the interim some industrious designers have been busy "stitching" the entire thing into one huge image. See what you can do with it now. Bethlehem Lutheran Church Record Transcriptions Baptisms from 1850 - 1865. Bethlehem Lutheran Church Record Transcriptions Baptisms from 1866 - 1869. Bethlehem Lutheran Church Record Transcriptions Marriages from 1850 - 1874. Almost 2000 names listed counting Grooms, Brides, Parents, and Witnesses. Bethlehem Lutheran Church Record Transcriptions Deaths from 1851 - 1885. More than 900 entries. Some news from MoDOT that should interest any St. Louis historian. Five years ago I placed a website on these "Genealogy in St. Louis" pages that dealt with a local St. Louis man who had searched and found the information about his birth parents. Dr. Jerry Cline was now come out with a book entitled "Born and Raised". You can get a signed copy directly from Jerry using this order form. A Who's Who, Where's Where and When's When of the Golden Age of St. Louis Rock and Roll Bands, Clubs, Agents, Radio and Fans. This 1814 pictorial representation of the fur trading post show the buildings that made up St. Louis. This excerpt of the book entitled "Remembrance of the Diamond Jubilee - June 21, 1925 - 1850-1925 - German St. Vincent's Orphan Society" was transcribed by Dave Lossos on July 16, 2010, using a copy of the book graciously provided by Loretta Smith. Some fascinating articles written in 1899 about St. Louis' early criminal justice with details on the victims as well as the perpetrators. A few months ago I was the recipient of a one hundred year old "yearbook" from Yeatman High School. For those of you not familiar with this high school here in St. Louis, it opened in 1904 at 3616 North Garrison. In 1927 its name changed to Central High School. This yearbook is more of a scrapbook of memories of the class, and it's title is "The Girl Graduate - Her Own Book". It was obviously a pre-cursor to today's high school yearbook. Over the next few months I'm going to be publishing all the photos and articles found it this book, in hopes of finding connections to the people contained in it. I'm also going to add the family histories of as many of the 63 graduating seniors as I can trace. If you see someone that you know send me the info and I'll publsih it on this page. Check this website periodically. After closing almost a year and a half ago, there is no opening in sight. The preface (27 pages) starts with an extended lament from the author, James Green, concerning all the problems he encountered in putting the directory together. Following that he does a nice job of covering the following topics: A review of statistics of current St. Louis, Directory of Streets and Avenues, Mortality among Children in St. Louis, Public Schools, Kemper College, Catholic Institutions, Catholic Free Schools, Churches, St. Louis Lyceum, Public Offices - United States Offices, Public Offices - County Offices, Public Offices - City Officers, The Bank of the State of Missouri, at St. Louis, Military and Fire Companies, Principal Hotels in St. Louis, Newspapers. The directory itself, with more than 7000 entries, and a list of abbreviations used. A map of St. Louis that I created that identifies the streets in the 1840s. The original directory did not include a map. NBC aired its first episode of "Who Do You Think You Are?" this past week. This series has been running in Europe for years. Take a peek at an episode filmed by the Irish-based production company here in St. Louis (I'm even in it). I received this link from Dusty Reese at City Hall. Thanks Dusty. Doug has outdone himself. According to Doug it is much better than his first web site on the park. "It even incudes a film clip on the fire! and a front seat ride on the Comet!" Most St. Louis researchers know of the tremendous contributions made by Bob to our hobby of genealogy. Bob passed away September 26, 2009. He will certainly be missed. Here's a personal "genealogical" story I've written about the cold-blooded murder of my grandfather in 1929. No one was ever punished. "On the road to my Great-Grandfather"
Published over a decade ago, this detailed research on how to go about finding our missing ancestors that might have ended up in an orphanage is the best of it's kind that I've seen. In addition it gives a glimpse into a time in St. Louis that few of us have seen before. Thanks to Peggy Greenwood for sharing her incredible work with us all. A personal account by Dr. Jerry Cline on the path he took in researching his birth family, and the surprising outcome. "The Hidden Youth of Helen Tappeiner Lossos"
This is a story I wrote to share the research I'd done on the secrets that my mother had kept from me and my siblings. "The McQuillen Saga"
Here is the complete story of Jim Brasher's bird's eye view of his growing up in a unique Irish family. Told in a fresh, fast-paced style, Jim's words come alive as he paints a picture of St. Louis that many of us knew about, but few of us experienced. The following links provide access (from home) to the Heritage Quest databases. All you need is a valid Lubrary Card. For those out of the St. Louis area, I'd be surprised that your local library doesn't provide the same thing. I've purchased the first four volumes of "The Search For Missing Friends: Irish Immigrant Advertisements Placed in the Boston Pilot". So far I have transcribed all of Volume I and II for anyone that is listed that relates to the St. Louis metropolitan area. I intend to continue with the other two volumes at time permits. Published in 1989 by the New England Historic Genealogical Society, this multi-volume set contains many thousands of Irish-American immigrant "Missing Friends" advertisements that appeared in the Boston Pilot from 1831 to 1916. Volume I contained those posted in the 1831 to 1850 timeframe; Volume II has 1851-1853. There are about 4000 Irish names listed. Some descriptions and images of hotels that have long since disappeared. Here's another website sent to me by Katie. From a copy of this book that I got on eBay, and over time I'm going to transcribe sections that might be of interest to St. Louis historians and genealogists. Statistical Facts About St. Louis - 1925 A total of 68 "little known" facts about our fair city. Obviously written to "toot our horn". Hospitals in St. Louis - 1925 A list of 55 hospitals active in 1925. Gives location and usually names of people in charge. Cemeteries in St. Louis - 1925 A list of 50 cemeteries active in 1925. Gives location and usually names of people in charge. St. Louis City Places of Worship - 1925 A list of almost 1100 churches with addresses and in most cases names of clergy. St. Louis Photographers - 1925 A list of 116 photography studios. News was released this week that the St. Louis Public Schools are considering shutting many of its schools. Although not finalized, if even half of these schools are razed, shuttered, or sold, it will be a tremendous blow to St. Louis history. Click here to see the list. This website provides link to just about all Catholic parish websites that exist. Many provide history of the parishes and contact e-Mail and phone numbers. Names of members listed in the 1913 Silver Anniversary Commemorative Book. Another outstanding transcription from Bob Doerr. This time he has completely transcribed the entire 1845 St. Louis City Directory. Take a look via the link above. Under the dubious heading of "Better late than never" the Missouri Historical Society' Library on Skinker now has a searchable index on the web. With the marvelous images received from Sandra Kieffer (through the courtesy of Brandy Brogan), I've put together a small tribute to our parents and grandparents whose major form of entertainment in this period was the dancing halls. My book collection continues to grow (to the consternation of my wife). The total is very close to 300. Take a look and see if there's something around that you didn't know about. This fascinating book was written in 1878. Filled with illustrations, it also has some unique perspectives of life in St. Louis in this fascinating period of St. Louis development. This link is to a PDF file that I transcribed of the Index. The best part is this is one of a number of books that have been digitized and made available FREE online by GOOGLE BOOKS. This announcement was made October 22, 2007. It has special meaning to residents of St. Louis since we reside in the city that is currently the source of this valuable genealogical information. The National Personnel Records Center (NPRC) will open for the first time all of the individual Official Military Personnel Files (OMPFs) of Army, Army Air Corps, Army Air Forces, Navy, Marine Corps and Coast Guard military personnel who served and were discharged, retired or died while in the service, prior to 1946. Contained in a typical OMPF are documents outlining all elements of military service, including assignments, evaluations, awards and decorations, education and training, demographic information, some medical information and documented disciplinary actions. Some records also contain photographs of the individual and official correspondence concerning military service. To view an original record, individuals may visit the NPRC Archival Research Room in St. Louis, MO. Telephone is 314-801-0850. Research room hours are10 a.m. to 4 p.m. Central Time Tuesday through Friday. Visitors are strongly encouraged to call ahead to make reservations. To obtain copies of records, customers may write to NPRC at 9700 Page Avenue, St. Louis, MO 63132, fax a request to 314-801-9195, or submit a request through http://vetrecs.archives.gov or on a Standard Form 180. Gives an insight into life at that time in St. Louis. He mentions two major events: the Cholera epidemic and the great fire. Bob Doerr has completely transcribed the entire 1860 St. Louis City Directory. Take a look via the link above. A little background on more than 450 pre-1900 churches, synagogues, chapels, and missions in the St. Louis metro area. I finally completed this project in April, and it's taken me this long trying to figure out how to present it. I made a few hardcopies, and gave one to St. Louis Public Library, St. Louis County Library, and St. Louis City Hall Recorder's office. However, I decided to try and put it on the website, in spite of misgivings about it's size. The hardcopy is 100 pages long, and includes many of the old 1840 graphical advertisements. I'll be putting those out on the website shortly. Lastly, I "created" a detailed city map for the timeframe (the 1840 City Directory did not include one). They can all be accessed through the above link. Including a photo of the graduating senior class, and photo of the reunion held 25 years later. This link provides a fascinating interactive map of downtown St. Louis in 1804. Scroll around the map and magically each house shows the owner of the dwelling. Thanks to Donna for bringing this website to my attention. Without a doubt the finest website on St. Louis' architectural treasures. Transcribed by Robert Buecher, this database contains news items about Millstadt, Illinois that were originally published in the "County News" column that appeared in the WEEKLY ADVOCATE of Belleville, Illinois from 1880 - 1894. These databases are not on the "Genealogy in St. Louis" server, so click "Back" on your browser to return here. 1877 Petitioners to St. Louis Mayor H. Overholz to be a Candidate for Re-election From an old German St. Louis newspaper. Births, Dieburg und Kleinzimmern, Hessen, 1812-1830, SS. Peter & Paul Catholic Church A large group came to St. Louis from Dieburg in 1847; the arrival list (New Orleans) is missing. Surname Index, Missouri State Genealogical Association Journal, 1981-2005 (NEW 1/18/2006) WARNING: Takes forever to load. The restoration of Belleville's Gustave Koerner home, on Mascoutah Avenue at Abend Street, has commenced. Gustave Koerner was one of Belleville's most illustrious citizens. Once complete, the home will be opened as a museum, where Koerner's life and political career will be interpreted. The "Irish American Post", (Journal of Contemporary & Irish American Affairs). The cover story deals with an interview between me and the editor on my "Irish St. Louis" book. Seldom does a person run into genealogical data that has been recently "discovered". This database falls into that category. Karen Elder, Special Services Supervisor at the St. Louis County Department of Revenue, recently found and transcribed a long lost book of marriage records. The majority of the 750+ licenses are in the 1876 - 1888 timeframe. Written by Joseph Cada. It was published in 1964 by the Center of Slav Culture, Saint Procopius College, Lisle, Illinois. Another outstanding database is available online from the Missouri Secretary of State office. The Soldiers Database is a comprehensive database abstracted from the individual service cards and listing more than 576,000 Missourians who served in the military from territorial times through World War I. It includes entries for twelve wars and military engagements in which Missouri soldiers took part. These range from well-known wars, such as the War of 1812, the Mexican War, the Spanish-American War, and World War I, to the battles that were peculiarly Missourian, including the Heatherly War of 1836, the Mormon War of 1838, and the Iowa (Honey) War of 1839. The bulk of the service cards, over 380,000 of them, record the fractured history of Missouri during the bloodiest of all American wars – the Civil War. Transcribed from the COURT OF COMMON PLEAS (1841-1847). Compiled by Linda Mahood Morgan. An early St. Louis merchant and philanthropist, John Cavender is difficult to find in any St. Louis historical and biographical works. Tidbits from St. Louis Newspapers Includes marriages, births, obits, and news articles. Provided by Kellykid (aka Winnefred). (Last updated September 20, 2002) Mallinckrodt School Graduating Class Lists Includes all graduates from 1945 thru 1960 (nearly 800 people). Provided by June Long. Outline Plan of St. Louis City and County - 1883. This particular map shows the township boundaries of St. Ferdinand, Central, City of St. Louis, Carondelet, Bonhomme, and Meramec. (published in "History of Saint Louis City and County..." by J. Thomas Scharf, 1883). 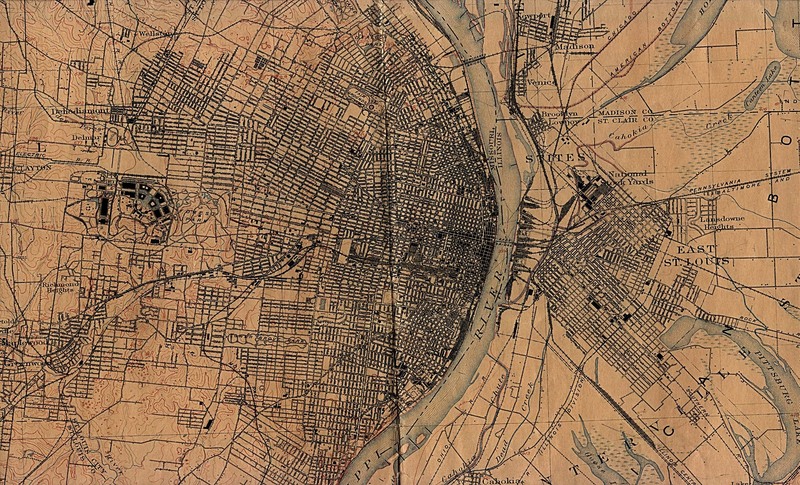 1890 Atlas of the City of St. Louis (Cram). The original map is 9 3/4 by 12 1/4 inches, and therefore I couldn't scan it in as one continuous image. The middle of the map can be found here and the bottom of the map (around Carondelet Park) and the Map legend can be found here. Link to 1912 Map of the Metro area. 1822 Map of the City of St. Louis. 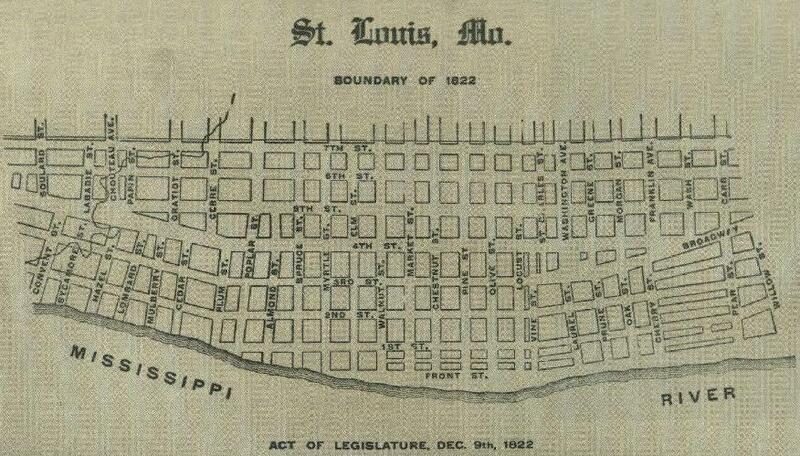 A very detailed street map of the City of St. Louis, showing boundaries by Act of Legisature, December 9th, 1822. This is a nice detailed map of downtown St. Louis, with an index to points of interest. I have a whole website dedicated to this topic. is provided by Tracy Lewis of Anchorage, Alaska. This chart will make it a little easier to locate families in St. Louis in the 1880 census. There are a number of websites that provide search engines to this awesome data. The one I used to use was Ancestry's Social Security Death Index. However, although they use the same database, Family Tree Legend's search engine seems to be a bit more flexible (e.g., use 3-5 character prefix of a surname for when you're not sure of spelling, and age of death (handy when you have no idea of birth or death dates). Remember, Social Security began in 1936, so naturally people that died prior to that date will definitely not be included. Also, it is not an index to all deceased individuals who obtained a Social Security Number, nor is it a database of all deceased individuals who have received Social Security Benefits, or whose families have received survivor benefits. The SSDI contains information about persons with Social Security numbers whose deaths have been reported to the Social Security Administration. Beginning in the early 1960s, the SSA began to use a computer database for processing benefits. About 98% percent of the people in the SSDI died after 1962, but a few death dates go back as far as 1937. Probate files from 1802 to 1900 have been indexed and are available through this online database. To date, cases up to 1865 are digitized and images of the case documents are available for online research. These Probate records are searchable by name or date. Another great project undertaken by the State of Missouri. This is the second volume from this set and contains 351 biographies and photographs of leading men of the first century of history in Missouri (1820-1921). Though this manuscript covers the entire state of Missouri, a good portion of the individual biographies are on people who had resided in St. Louis at some point in their life. BTW, this data is offered by the same wonderful folks that provide me with the free webspace for all these "Genealogy in St. Louis" websites. 1874 Atlas of St. Clair County Partial List of Patrons Town 1 South, Range 9 West (aka Millstadt/Centerville). 81 people identified. is a book filled with memories of growing up in St. Louis in the 1920s and 1930s, and loads of pictures too. This is the complete four part series of articles written by Jim Shoemaker. It's a fascinating treatise on the hobby of genealogy converging with the science of genetics. Listing of the approximately 600 households listed by John Paxton in the first ever St. Louis Directory, along with a street naming matrix. Here's an index of every listed landowner (NOTE: not necessarily every homeowner) in St. Louis metro area in 1878. The "Central Verein" has been around since 1855. The library holdings of this organization are predominately devoted to sociology, history, economics, philosophy, and theology. But there is a huge collection that is mostly Catholic-Americana with German-American history. Their records are most complete for the time period of the 1930-40s during which there were many displaced St. Louisians of German descent. "The Hidden Youth of Helen Tappeiner Lossos"